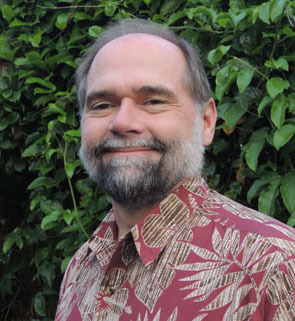 The History Department at the University of Hawaiʻi at Hilo provides students with an understanding of the past and its application to the present. The curriculum leading to the degree of Bachelor of Arts in History is designed to develop broad historical knowledge, global understanding, and important skills in data analysis and communication crucial in many professional fields. The week of 11/26 to 11/30 the Kipuka Native Hawaiian Student Center (PB 10-1) will be hosting several events. Please join us on Monday, Tuesday, and Wednesday to celebrate National Hawaiian Independence Day through mele 'ai pohaku, cultural activities, and t-shirt printing. For more information, please visit the Kipuka website. This coming summer Prof. Michael Skinner is leading a 3 week (June 3-23) study abroad program to India. The program will starts in Mumbai, ends in Delhi, and includes numerous historical and cultural excursions. 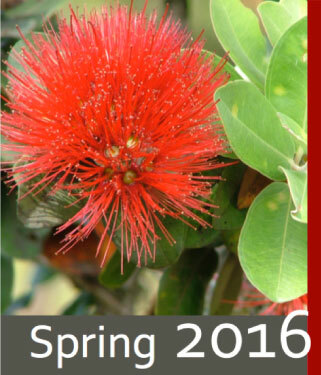 For more information visit the program website or contact Professor Skinner directly (mskinner@hawaii.edu). In early November, a group of students studying history at the University of Hawai‘i at Hilo traveled to Kalaupapa, a historical community on Molokai where patients with Hansen’s disease, also known as leprosy, were quarantined at the peninsula over a 103 year period. Please read the full article to learn more about their sevice learning trip by visiting the UH Hilo Stories webpage. U.S. history award -- Robert Villanueva. The annual History Senior Symposium (PDF) marks the culmination of our history majors' journey toward graduation. The seniors enrolled in this course have spent at least a year immersed in the research for their senior thesis paper -- a 30+ page paper meant to draw upon their preparatory course work in their focus area and methods courses, as they apply their skills in research, analysis, and communication (written and verbal) of an historical topic of their choosing. The formal senior thesis journey begins in the fall semester in "HIST 490 Historiography & Resrch Mthds (3)", and then culminates in the spring semester in "HIST 491 Senior Thesis (3)" -- leading to the symposium. A variety of topics are presented each year. This is a result of our students being able to focus their history degree on one of five regional areas: E. Asia, Europe, Hawaiʻi, Pacific, or U.S. When & Where: Thursday, May 5th, 8:30-3:00pm, UCB 115. The symposium is open to all. Associate Professor, Kerri A. Inglis, was invited to speak on the history of Hansenʻs Disease in Hawaiʻi at the Damien Center in Leuven, Belgium. Inglis visited the crypt where Damien is buried in Leuven, his birthplace in Ninde, and where he was baptized in Tremalo, before delivering her presentation "Maʻi Hoʻokaʻawale ʻOhana--the disease that separates family." 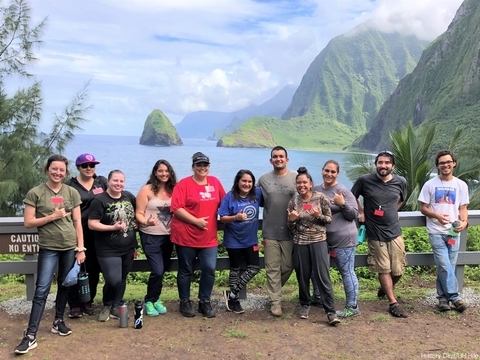 Nine students accompanied Prof. Kerri A. Inglis on an annual service-learning trip to Kalaupapa, Molokai, in early November. The students gained direct knowledge of the history of Hansenʻs disease in Hawaiʻi and the role of isolation in that history. Additionally, they learned of the wahi pana (sacred, storied places) and oral traditions of the peninsula, while they helped remove invasive species and cleaned cemeteries, cleaned settlement structures, and helped remove trash from beach areas. 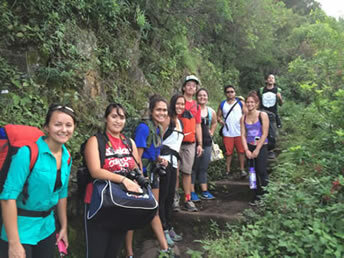 In Fall 2014, Prof. Kerri Inglis’s public history in Hawaiʻi class spent their semester visiting, researching, and producing materials related to wahi pana (storied, sacred places) of Hawaiʻi island. 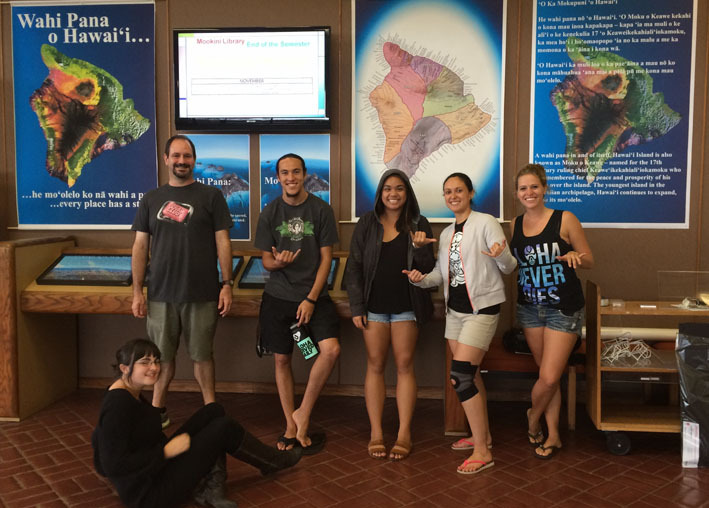 Their efforts culminated in the exhibit “Wahi Pana O Hawaiʻi... every place has a story” at Moʻokini Library in December 2014. The exhibit was invited back and is expected to remain through the Fall 2015 semester. Congratulations to our students: Cletus Correia, ʻAlika Guerrero, Ciera Pagud, Kehani Tejada, Sarah Steinbrecher, and Karly Watts. Due out in the summer of 2015, Associate Professor Michael Bitter’s article, “Ministers and Favorites in the 1730s: An Analysis of the Dynamic Relationship Between Osterman and Biron Through the Eyes of Foreign Diplomats,” was selected for publication in a book of a collection of articles on Russia’s eighteenth century. 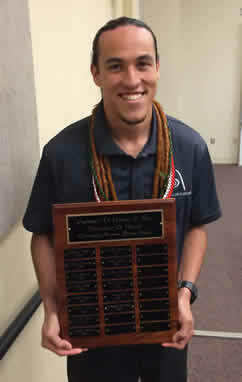 In April 2015, UH Hilo History graduate Evan Matsuyama received an acceptance letter into the prestigious Master of Arts in History program University of Oxford, England. 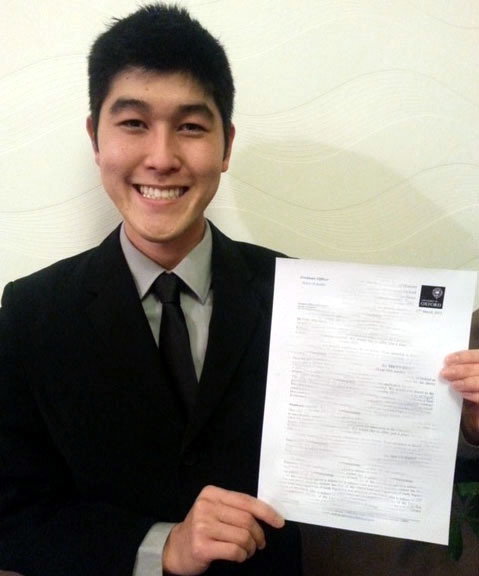 While majoring in History at UH Hilo, Matsuyama earned a 4.0 GPA, was president of the History Club, a member of Phi Alpha Theta, and was selected the student speaker for the Fall 2014 Commencement. Congratulations Evan!